The year 2014 will be remembered as the year when for the first time ever, Kenya came very close to the fifteens rugby world cup. It will also be remembered as the year in which infighting caused chairman Mwangi Muthee and sevens coach Paul Treu to resign. 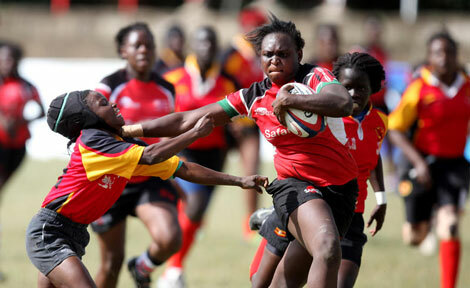 Kenya swept all three categories of the Elgon cup over neighbours and arch rivals Uganda. Kenya’s U-19s beat their Ugandan counterparts 27-12 on the day to claim a 37-27 aggregate win, having lost the first leg 10-15 in Kampala last weekend. The Kenya Lionessess were too powerful for the Uganda Lady Cranes beating them 39-10 at home for a 72-25 aggregate win that saw them reclaim the title. And in a sign of how far ahead of Uganda Kenya is, the men’s category featured a second string side named Kenya A who also won the Elgon cup. Trailing 14-21 from last week’s first leg in Kampala, Kenya A romped to a 34-0 shut out of Uganda that saw them win the Elgon Cup 48-21 on aggregate. After having won the 2013 Africa Cup, Kenya were poised to qualify for the rugby world cup for the first time. Kenya had started on a bright note, beating Namibia 29-22. It marked the first time that Kenya had beaten Namibia away from Nairobi. Against madagascar in the second match, Kenya rested most of the players who had beaten Namibia but still beat hosts Madagascar 34-0. Kenya had never beaten Madagascar before. 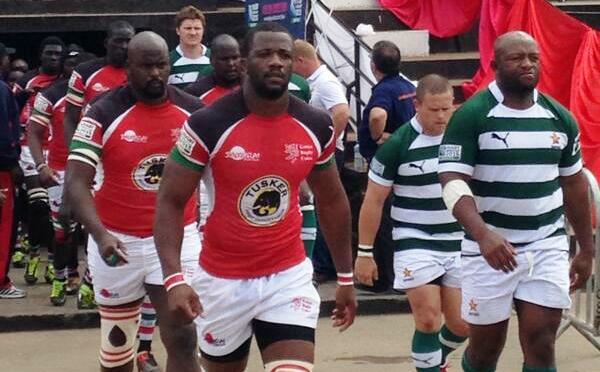 However Kenya choked in their last match, losing 28-10 to Zimbabwe. South African coach Paul Treu had joined Kenya in December 2013 as coach following the resignation of Briton Mike Friday. Prior to becoming Kenya coach, Treu had coached the South African national sevens team for 8 seasons. Everything looked very promising. Treu was given a contract much larger than Friday’s contract. And he was allowed to bring two assistants on board. However his stint was characterized by very poor performances. KRFU offered patience saying it would take time for the players to adapt to Treu’s system. After a dismal 2013-2014 season, KRFU decided to review player contracts and change them to make them more performance based. This angered several senior players, some of whom opted out of the team including Collins Injera, Dennis Ombachi, Bill Odhiambo, Michael Wanjala, Horace Otieno and others. The absence of senior players compounded Kenya’s problems. The 2014-2015 season started poorly for Kenya. Coach Paul Treu soon resigned citing too much interference from the KRFU board. It had been the same reason Mike Friday resigned in 2013. Felix Ochieng, a former player, was appointed as coach to replace Treu. Vuyo Zangqanga was retained as assistant coach. Mwangi Muthee had been a very successful KRFU chairman after he took over from his predecessor Richard Omwela. However there was constant infighting within the KRFU board. In particular Philip Jalango was a constant pain in Muthee’s neck. There were also accusations of financial impropriety. Clubs wanted KRFU accounts audited while the board resisted. In the end Muthee resigned citing constant frustrations from other board members, much to the shock of the rugby fraternity and sponsors. In his resignation letter, Muthee accused some KRU board members of derailing his agenda of driving the game further, adding their integrity “was not beyond reproach, threatening to bring the game into disrepute”. According to Muthee, the affairs at the union have been so bad that sponsors have constantly raised questions about some board members’ involvement in grave issues of conflict of interest in the supplying of kit to the KRU and rugby fraternity. While singling out questionable procurement of airline tickets worth tens of millions of shillings, Muthee also questioned hotel accommodation contracts and many other inflated bills that he said were done outside established KRFU channels. Former player and current treasurer Gabriel Ouko was appointed as chairman on an interim basis. This entry was posted in Kenya Rugby Articles, Kenya Sports news and commentary and tagged Kenya Rugby history, Kenya Rugby Review, KRFU, Mwangi Muthee, Paul Treu. Bookmark the permalink.